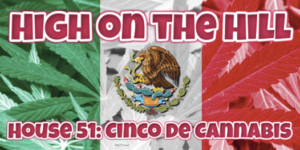 Celebrate your love of Mexican cuisine and canna with two of DC’s favorite chefs on Friday, May 5 at 7 PM at Hosue 51. You will enjoy four infused courses in a gorgeous candeliit dining room. Bud Appetit and Chef Sassy will create for you Mexican-inspired dishes, all with canna twists. *HOUSE 51 address will be emailed to all registered ticket holders.